Greetings, Loggers! By now, you know that college life is filled with new responsibilities that aren’t exclusive to your academic growth. Adulting is tough! If this is your first time living independently, topics like managing your finances, maintaining your living space, and even cooking for yourself might seem completely overwhelming. In addition to providing practical information about other topics, the Life Skills Collection at Collins Library has many resources to help you respond to these practical challenges. Wondering how to maintain your living environment, make minor repairs, and clean up life’s unexpected messes? Consult The Useful Book, an encyclopedia of practical how-tos and home care tips. If you like your cleaning advice with a little humor, we also recommend the hilariously titled (and super helpful!) My boyfriend barfed in my handbag … and other things you can’t ask Martha. Living off campus? Know your rights! Renter’s Rights: The Basics is packed with the critical legal and practical information that every renter needs. Do you have questions about your finances? 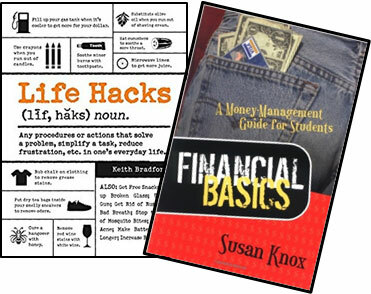 Learn the basics and get your financial life in order with The Finish Rich Dictionary: 1001 Financial Words You Need to Know or The 60-minute Money Workout. Additionally, pick up FREE educational materials created by theFederal Trade Commission and covering a broad range of topics to learn more about how to responsibly manage your financial identity and resources. Finally, don’t forget about our selection of cookbooks to help you maintain your health and whip up delicious, easy, and budget-friendly meals for you and your friends! No cooking experience is necessary with titles like The Ultimate Student Cookbook, Ultimate Dining Hall Hacks, and The Quick and Easy College Cookbook.